The changing customer behaviour is a bigger future challenge for Intersport in Denmark than any competitor. COO Thomas Just Rasmussen tells ScandinavianRetail.com about the first year after the takeover of the sportschain – and what’s needed in the future. He says Intersport now have to focus on creating the best business model. 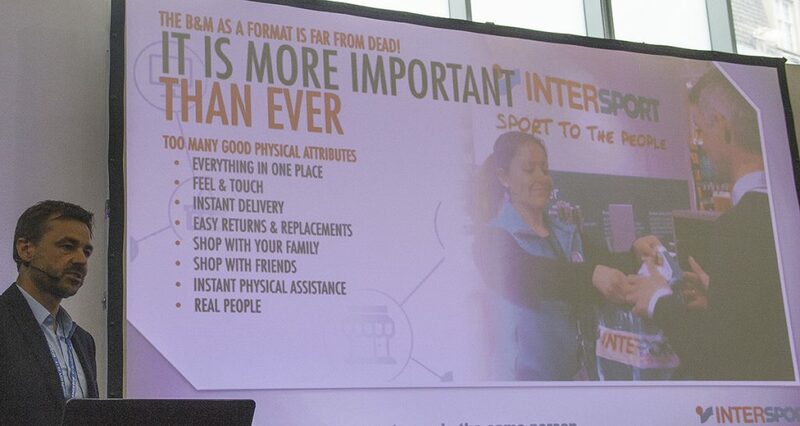 The change of dynamics in Intersport has meant that everybody now believe in the same mission and he describes the partnership as an improvement for everybody. We meet Thomas Just Rasmussen after his session at the Retail Design Expo in London. The subject was how to give customers the same approach in all channels. It sounds like you’d prefer the customers to come to the store to collect their products before buying online? Nevertheless, the possibility of extra sales in the store makes Thomas Just Rasmussen put the best seller at the click & collect stand. Accessibility to Intersport is important. He talks about the importance of being tight on the customer and believes the online players are no dangerous competitors to Intersport. He also notes that the Nordic growth machine XXL only has announced an online entry in Denmark. He describes the customer behaviour as a larger challenge than any certain player when it comes to competitiveness in the business. Many players are offering parts of the sports category assortment and it’s increasingly important to be relevant borth online and offline. Sports retail has been a late adapter when it comes to omnichannel? Are you being pushed now? The last year Intersport Denmark has been working more close with Intersport Sweden, mainly regarding purchasing and logistics, but also sharing experiences between managers. But you choose some different strategies. Is Swedish Intersport’s pilot initiative with digital kiosks at traffic sites like airports something you would consider? On the other hand, Intersport Denmark is the only Nordic Intersport to introduce the chain Athlete’s foot. Thomas Just Rasmussen says the sneakers market is an opportunity and a way to reach customers who does not visit Intersport. You took over Intersport management a year ago with a lot of challenges – and you’ve also lntroduced a new chain. Isn’t it hard to keep focus? And how is Athlete’s Foot doing? ”We’ve opened four stores ourselves (totally 7 in Denmark) today and I am actually satisfied with the way it’s moving ahead. We need to see them grow locally, make them national through the larger cities. Intersport has stated it will open 50 new stores in Denmark. A great part of them are updates or re-profiling. ”But there are blank spots in Denmark where we’ve already started to open new stores the last six months and we know there are more to come. But we have to be realistic. We will see Intersport shops close or relocate as well. But we are sure, that we will see growth in our turnover and a total of more Intersport shops in Denmark during the next five years. What will happen with sports retail the next years in Denmark? ”We need to focus on the customer behaviour and be better in the seamless retail. I like that word better than omnichannel. And we have a retail category in Denmark that somehow needs to make changes. Maybe there’s not room for everybody,” says Thomas Just Rasmussen. Thomas Just Rasmussen, COO of Intersport Denmark and co-owner of OB Sport at Retail Design Expo in London.